Free movement of workers in the EU has made life tougher for low paid workers in the UK, Andy Burnham has said. He was making a pitch to win back Labour voters from UKIP in his first big speech as shadow home secretary. He said it was "not true" that free movement had benefited everybody as Labour had claimed in the past. UKIP said it was a "welcome recognition of the blindingly obvious" but if Mr Burnham wanted to do something about it he should campaign to leave the EU. Labour leader Jeremy Corbyn, who beat Mr Burnham to the Labour leadership by a wide margin, has meanwhile stressed the positive contribution EU migrants had made to the UK. "People that have migrated to this country over many years have made an enormous contribution to our society, helped our economic growth, helped our health service and helped our social services and our education services, so don't look upon immigration as necessarily a problem, it's often a very great opportunity," Mr Corbyn told BBC Radio 4's Today programme. 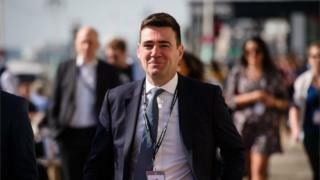 He said Mr Burnham had made the point during the leadership campaign that the government needed to be "far more focused" on the lack of doctors' surgeries or school places and housing difficulties in certain areas. But Mr Burnham said in his speech that Labour had not "faced up" to some of the impacts of EU migration and consequently appeared "out of touch". "To win back the voters we lost to UKIP, I want to reframe the debate about immigration and the way Labour approaches it," he told delegates in Brighton. "For too long, we have argued that free movement across Europe benefits everyone and affects all areas equally. That's just not true. "In places, a free market in labour benefits private companies more than people and communities. Labour hasn't faced up to that and that's why we look out of touch." He said David Cameron's renegotiation of Britain's relationship with the EU, ahead of a planned in/out referendum, provided an opportunity to protect workers. "The truth is that free movement on the current rules is widening inequality. It has built the economic power of the big cities and that is good. But it has made life harder for people in our poorest communities, where wages have been undercut and job security lost. "The coming referendum presents a chance to change that. Let's seize it as an opportunity to put Labour back on the front foot and back in touch. "Let's put forward a new vision for a social Europe. A Europe that puts people before profits and multinationals; a floor beneath all workers. The Tories and UKIP want to take those protections away. "Let's have the strength to take on their scapegoating rhetoric which won't pay anybody's bills, feed anybody's kids or protect anybody's job. "We welcome people here to work, as we always have. But let's make it work for everyone with new EU rules to stop undercutting, protecting the going rate for skilled workers." UKIP employment spokeswoman, MEP Jane Collins, said Mr Burnham's words were "the desperate attempts of a man who has ignored the plight of the working classes due to mass immigration for years".